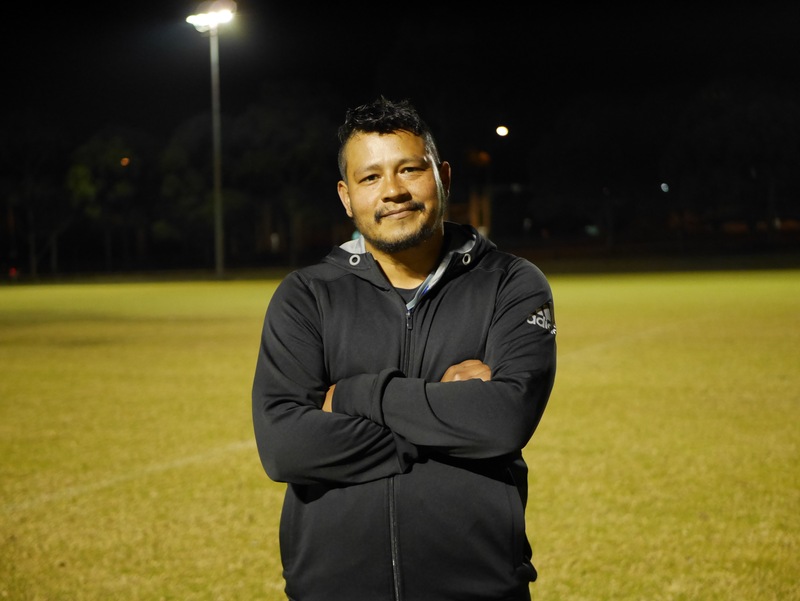 Paco and Daniel Godinez are two prominent figures in the Sydney Salvadoran community. Both hold strong opinions on the importance of family, understand the necessity of cultivating a strong Latino community and love Rugby League. Daniel is even the president of Latin Heat Rugby League. Despite the odds against these cousins, both have managed to create successful lives for themselves in Sydney. C: When did you both arrive in Australia? P: We came to Australia in the 80’s. D: Yeah, I came in 88, I was 3 years old. P: I came in 1985, I was 7 or 8. El Salvador during the 1960’s our fathers [who are brothers] were raised by a single mother. They were kicked out onto the streets and homeless because their mother passed away when my father was 14 and Paco’s father would have been 16 or 17. They lived on the street for quite a long time in El Salvador, but they both met beautiful women and had kids. I think it’s one of the biggest success stories to come out of El Salvador because they made a life for themselves and then migrated to Australia. C: How did you get to Australia, Paco? P: I was 6 and my mum’s brother got killed. He got 8 shots to his head. There was a civil war going on in El Salvador at the time and they found my uncle in a garbage dump. The only way they recognised him was because he had some peace sign on his gold teeth. During my first year of school, my dad was dropping me off and some guy came to the car, put a gun to his head and like 5 guys got into the back where I was. They told my dad to move over because they needed his van to drive around the corner, they wanted to get me out of the car and I wouldn’t budge. I was just holding onto the van, I was crying and making too much noise. These guys had all these weapons and my dad offered them money to let us go and take the van. At the time my dad was working as a money exchanger, so he had a bit of cash on him. They let us go after taking the money but 2 weeks later they came over to my dad’s work and asked for more. My dad told them he didn’t have any cash and they let him go. He came home and said to my mum “sell the house”, “I’m leaving El Salvador, I’ll meet you in Mexico, sell whatever you can and I’ll see how I can get you over there”. Two weeks later, we couldn’t sell the house, we ended up in Mexico and were over there for 6 months. We got our visas and Australia let us in, so we came to Australia and then Daniel’s family applied and they came over too. It was pretty hard growing up in Australia because you’re used to your old life and your own house in El Salvador. My dad came from the streets and he had it made, he had a good house and losing it all was just daunting to everyone. A: When you got to Australia did you arrive in Sydney? P: Yeah, we were in Randwick first and then went to Villawood, which is now a detention centre. We stayed in Villawood for around 6 weeks. Then all my family, my mum’s family came over and Daniel’s family came over. So we have a big family now in Sydney. A: Do you know other Salvadorans that live in Australia? Do you have a community here? D: A lot of the guys we met, we met growing up but at the same time, we’ve met them through Latin Heat. 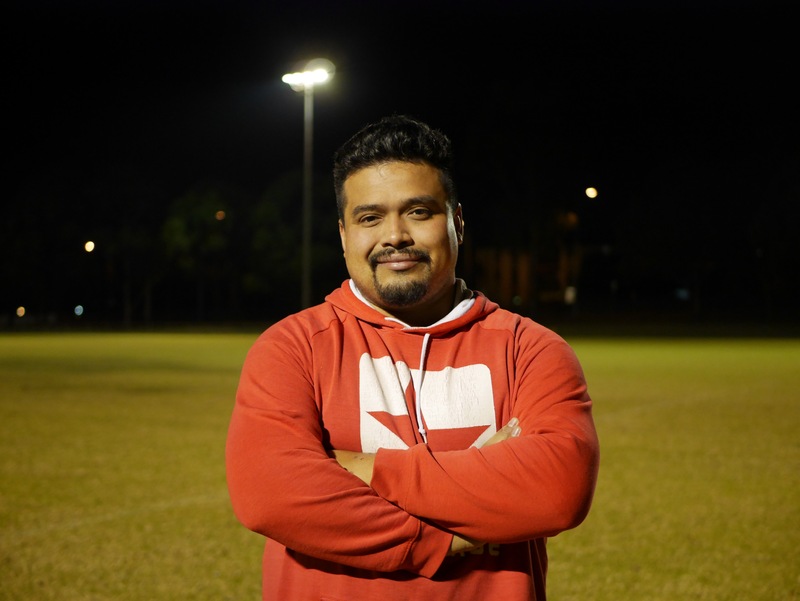 A man named Rob Burgin had a dream about making Latinos play Rugby League in Brasil one day. He brought that idea back to Australia and he started forming national sides, one of the teams was El Salvador. The first time we played, it was the first time that I played alongside my cousin, alongside my nephews and it was pretty much 3 generations playing on the same side. Through that footy team, we met other Salvadorans that we didn’t even know existed. We now know Salvadorans from Canberra, Melbourne, Brisbane and we’re all coming down on September 30 to have a really big game. C: How did you get to Australia, Daniel? D: I came over here with my parents. We were actually sponsored by the United Church on Pitt Street. They sponsored us to come over here pretty much because of my father. In El Salvador during the civil war, if you got onto the bad side of anyone, for example a neighbour and they were on the side of the Government they would say ‘that guy over there is talking against the Government’. Then the rumour mills would start, then they [the Government] would come and visit you at night, that happened to my father a few times. Because of that we applied to go to Canada first, we got accepted to go to Canada and at the last-minute, we received a postcard from Paco’s dad saying ‘hey, we love it in Australia ‘It’s a beautiful country, you should come over here’. A: Where did you live when you first arrived in Australia? D: We came over to Villawood first and I grew up in Alexandria. I know Alexandria right now seems like one of those really posh areas but back then it was very rough. Over time we made friends and integrated into the Australian culture. I couldn’t speak English until halfway through Primary School. The only way I got to integrate with the other Aussie boys was because as a Latino I was one of the bigger boys and due to my size, they wanted me to play Rugby League. 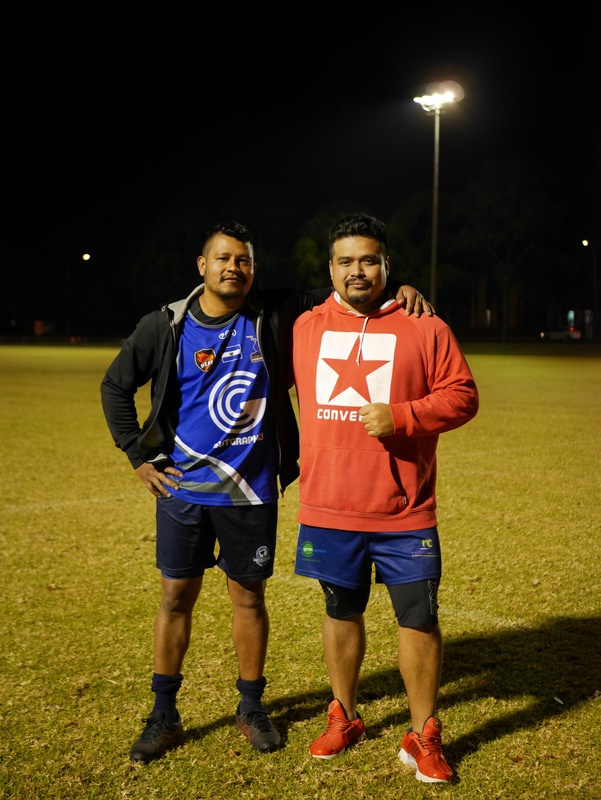 Rugby League got me through it, that’s how I met my friends. A: So Rugby League was how you socialised with people? D: Yeah, it’s how I socialised with Australian culture in the first place. Ever since I was a kid until now, Rugby League has been with me. C: Are you a very close family? D: We can actually say our family is pretty tight-knit. We encourage each other to achieve the best. For my brother and I, in particular, there was always this ‘he’s doing good so I got to do good‘ kind of attitude. We lift each other up and I think that kind of mentality is what Latinos bring and why they succeed over here in Australia, in the U.S. and all over the world. P: We have a lot of family over in the U.S.
D: They either arrived by legitimate means or by crossing the border. At the end of the day whatever they’ve done, they’ve always contributed to the country they’re in. Latinos are hard workers. There’s a lot being said about the money they send home but a lot is being done for the society and the countries they reside in. My brother went from being a labourer, doing small jobs here and there to actually working in I.T. Paco started his own property maintenance business, he’s doing well too. P: It was hard because I left school in year 9 because I hated it. I went St Pat’s in Fairfield and was into Rugby League a lot but I dropped out because I was hanging with the wrong crowd. Family was always there and got me on track. Growing up around Fairfield and Cabramatta was hard but I made a lot of good friends and in time I started my own company. I work in 5-star hotels doing their maintenance and painting. I’ve had my own company for 17 years now and I got my own house, so yeah, it’s pretty good. D: Those are the success stories. Myself, I got into technology and just climbed the ranks through that. Now I’m a manager and look after a large team. I never thought I’d be doing this at the start, I always thought as a kid growing up, I wouldn’t find my place. Over time I think it came as a consequence of realising that the work you put in is the seed that you sow to make a better life for yourself and that fruition makes who we are today. A: Do you think being part of this team allows you to pass on some of that wisdom you’ve learnt? Especially to the younger men? P: The reason I started playing on the El Salvadoran team was because I was suffering a lot of from depression and playing helped me get through it. Now that I look back I can see how it got me through the darkness. These young guys motivate you, you come out of your work shell, your family and you just spend that time with them. D: At the end of the day what we’re trying to do is 2 things. We’re trying to give those guys that are back home in our motherland another shot at getting somewhere and allowing them to feel that they’re part of something, to get them out of the struggle that they’re in. In Australia, it’s about getting the brothers and sisters involved in what we’re trying to do so that they feel part of something too, so they feel like they’re not alone. I think if we can do that, that will leave me feeling like I’ve contributed something to the community because that’s the way the community helped me. D: This whole thing wouldn’t have been possible if it wasn’t for Rob Burgin and he’s not even Latino. He brought this all together and we’ve taken it forward with his blessing. A: Can you explain a little more about how Latin Heat Rugby League works? Is there a team in El Salvador as well? D: Latin Heat aims to help the pioneers of the sport on the ground. There are some really passionate people that we assist in trying to grow the sport in Latin America. We have domestic competitions in Chile and Argentina. Major strides are also being made in Brasil, Colombia and Mexico, We’re yet to set up Rugby League in El Salvador but we’re close though. C: By assist do you mean you help sponsor them? D:A lot of the teams that are playing in South America right now, Latin Heat supports. So we support them by sending expertise over there and funding to get players from one location to another. Last year we had a tournament in Argentina and had to get the whole Chilean squad over there. This year we’re going to have a competition in November, the Latin American Championships in Chile and so we’re getting Mexico, Brasil and Uruguay to go over there. There will be 4 nations taking part. That’s what Latin Heat does to contribute. We also work with the Rugby League International Federation. Be sure to check out El Salvador versus Uruguay at Hillier Oval, Liverpool on Saturday, September 30, 2017. The game kicks off at 5:15 pm and Chile will be playing Thailand straight after. However, there will be a whole bunch of games featuring Latino teams starting at 2 pm.